Within the past 3 years I spent a lot of time researching and developing any kind of audio filters. In this section I hereby present some products based on this research and development. 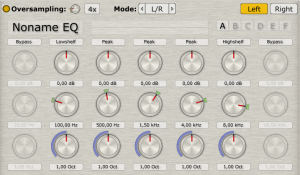 One of the most popular VST plugins I created is the Electri-Q. It was sold as software by our small company ‘AIXcoustic creations’ until the liquidation in 2013. However, due to historical reasons a freeware version called Electri-Q (posihfopit edition) is still available here. While having a lecture about digital signal processing at the university I came up with a prototype implementation of what I thought to be a transistor EQ. Although I made some errors in my calculation (far too strong non linearities) the EQ got quite popular. The name was a result of a crashed notebook of Mully (aka Multree), a friend of mine. In a joke we imagined that the last letters on his screen was something like: “fgidufau tzvh posihfopit” (can’t remember exactly). However a new name ‘Posihfopit’ was born. Later it became ‘Electri-Q’ and thus the particular development on this plugin is discontinued. The “Armyfopit” (very early version) plugin was one of my first variations of the Electri-Q. It was released as ‘EQ with some soft transistor distortion inside’. Since some years the development is discontinued and the link below is only here because of historical reasons. ‘Noname EQ’ started as a study for the Electri-Q v2. Later it was used for a comparison of filter implementations. Nothing fancy, just some stuff I haven’t tried before. The GUI is rendered entirely inside the plugin. Based on my VST plugin splitter/oversampler, an oversampled and splitted version of Noname EQ has been done. So far no-one has reported any issue with this variation of the noname EQ plugin, but this doesn’t mean that it has been tested entirely in any host yet. 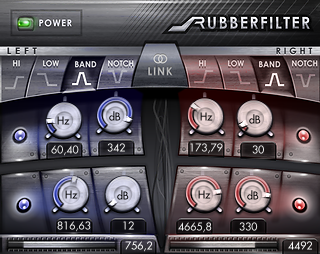 Use it on your own risk and please report any issues to improve the VST splitter/oversampler. Rubberfilter provides up to 64th order butterworth filters to ‘rubber’ out frequencies. This plugin was made to be a static tool. Automation of any parameter is on your own risk. 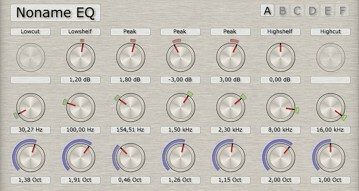 Tiny-Q is one of the world’s tiniest full-parametric EQ, if not the tiniest. At least in regards of the GUI. 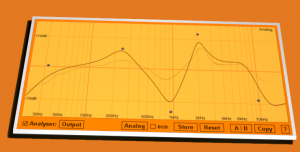 On not more than 4585 pixel you can find an eight band parametric equalizer with pass, shelf and peaking filters. Beside that there’s a small magnitude display and a level meter. 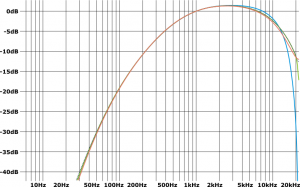 The design goals include to create a very small, fast and accurate EQ. The compromising side effects of a non-distracting GUI might come handy in some situations, when it is all about sound. Tiny-Q was my contribution for the KVR developer challenge ’07. The QR filter implements a lowpass if the frequency slider is on the left and a highpass if the slider is on the right. In between the audio is passed through. Additionally the Q can be changed. This implementation of A, B and C weighting filters (GUI-less) also features a plain C interface, that might come handy for other applications as well. The above plot shows the analogue prototype (dotted, dark green), a simple bilinear transformation to the digital implementation and some other proprietary variations, that are closer to the original without using more CPU resources than necessary.